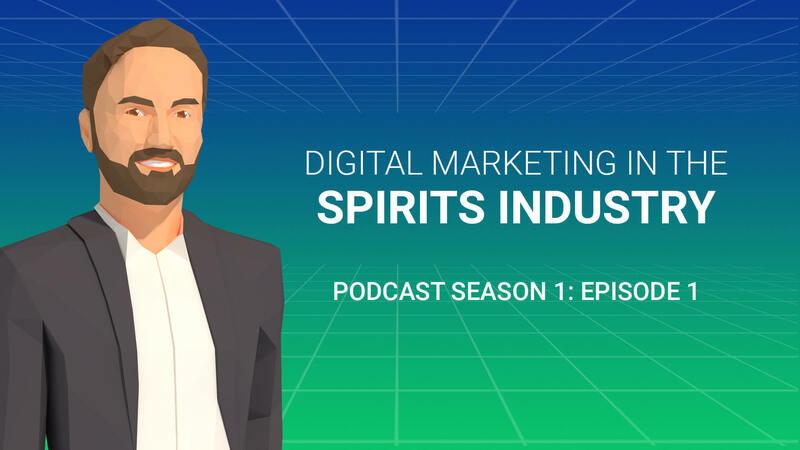 In today’s episode of Ecommerce Disruptors, Robert Brown, Director of Digital Marketing at Jagermeister sits down with us to give us his insights on marketing for the spirits industry. After leaving the agency life, Robert went on to head ecommerce strategy at Pernod Ricard which led him to his current role at Jagermeister. While this episode gives us insight into digital marketing for the spirits industry, Robert provides great tips for marketing in your own niche industry, explains how essential measuring KPIs are essential for any campaign, and tells us about challenges he’s seen brands face when trying to capture the right data. Enjoy the first of many Ecommerce Disruptors podcasts, and be sure to subscribe for more! Noel Lopez:	00:05	Welcome to the Ecommerce Disrupters podcast where alongside digital marketing experts we give you our best tips, techniques, and insights on how you can be a disrupter in your industry. Noel Lopez:	00:17	In today's podcast we're going to be chatting with Robert Brown, the Director of Digital Marketing at Jagermeister. This episode is going to give you insights on marketing for the spirit space, and it's going to be very helpful for you marketers out there working in your own unique industry. In the role we live in where data is king, there isn't always a straight answer as to what we should be measuring in our campaigns. You should be able to take some of this info and apply it to your own marketing strategy. I hope you enjoy the conversation as much as I did. Now let's dive into the interview. Noel Lopez:	00:49	Today we have a guest, Robert Brown, the Director of Digital Marketing at Jagermeister coming in. Super excited. Robert, if you want to say hi? Robert Brown:	00:58	Hi Ecommerce Disrupters. Sounds so serious. Noel Lopez:	01:02	So official right. Robert Brown:	01:04	I think every time you say disrupt we should take a shot. Robert Brown:	01:08	It's Friday. Noel Lopez:	01:09	Line up the Jager, here we go. Robert Brown:	01:12	I'm kidding. Noel Lopez:	01:13	Yeah so first of all, really happy to have you come in, super excited. Tell us a little bit about yourself. Robert Brown:	01:19	Yeah sure. Gosh, you're going to make me feel old right away because every time I think about this it actually reminds me of how long I've been doing this. But I've been doing digital marketing for about 14 years at various places for various organizations. Started on the agency side for almost a decade, or a decade there, and working at big agencies, digitally focused agencies, data driven agencies, et cetera, and for companies like American Express, Merck Consumer Care, which is now Bayer, which I think they've been bought again, the Claritin, Coppertone, Dr. Scholl's, some over the counter drugs. Then Unilever working on Dove and Dove Men Care, launching that brand extension in five categories from a digital perspective. Then moved over to the brand side and Pernod Ricard prior to my current gig, which is Absolut, Jameson, Malibu, a ton of wine and spirits brands. Then today, three weeks in, at Director of Digital at Jagermeister where I lead all of their digital efforts across the brand in the U.S.
Noel Lopez:	02:32	Nice. Quite the resume there. Noel Lopez:	02:34	I like it. I know, like you said, you started off in the agency side and moved to the client side. Is there anything you miss from the agency side? Robert Brown:	02:45	Loaded question. Yeah, I mean I think there are certainly benefits and cons on both sides. I think one of the things I miss on the agency side is one the relative lack of politics. You're so busy doing work that you have no time for politics. Robert Brown:	03:06	There's not a ton. Clients, that's full of them, so word to the wise. The other thing that I think I miss is on the agency side we incubate creative ideas. You can have a germ of an idea and it be incubated by everyone around you. On the client side you're selling a baked idea for the most part and trying to build coalitions. To me, that's the biggest difference between what happens on the creative side and what happens on the client side. It's one of the reasons why agencies will always exist is because you need that ability to incubate in a form that you're not trying to sell. Noel Lopez:	03:50	Exactly. Almost a night and day comparison really. Noel Lopez:	03:53	I know you listed a few of the brands that you've worked with, which ones would you say were your top favorite? Jager obviously is at the top of the list. Robert Brown:	04:03	I mean aside from Jager, who I love now, no I'm kidding, I love all of my babies. No, I really enjoyed working on Unilever and Dove and Dove Men. I mean it's an iconic brand. Anyone who gets to work on that brand probably feels like they're doing something really big and a big part of their career I'm sure. That was a highlight of my career working on that brand, but the other ones were all great as well. I had been fortunate enough to work on some really great brands. Noel Lopez:	04:38	Okay great. Out of those brands which ones would you say you faced some really tough challenges in terms of marketing or coming up with a strategy? Robert Brown:	04:48	American Express actually in particular was quite a challenge for me at the time. A lot of the work outside of American Express that I did was communication brand building, awareness, engagement, that sort of thing. American Express is a very different animal. The work I did there we were really developing products to solve real business needs and digital products. That's a very different skill set and imitative than an integrated campaign. It posed its own challenges, but rewarding in a lot of ways. Noel Lopez:	05:29	I'm sure. Right now would you say, and really any brand, who do you think is doing just a great job, just really coming up with their brand, brand awareness, their campaigns, everything they're doing? Robert Brown:	05:45	Gosh I can think of so many. I mean you see what Nike's done to really get back into the game and the conversation, and so I think they're doing a great job from communication and PR perspective. You have brands like Starbucks from a conversion and digital tools and digital experience perspective, they're getting I think over 50% of their sales at this point from their digital and mobile apps, which did not exist a couple years ago. From that perspective I think they're doing a great job. I think in terms of full CRM and thinking about the full consumer experience, you look at like a Peloton. I think they do a great job of full funnel marketing and really owning CRM and taking consumers through that journey over and over and over again. I really enjoy what they do as well. Noel Lopez:	06:41	Yeah. I mean with all those brands you really can see that shift to hyper-personalization, making sure that it's all about the consumer, making that experience just top notch. Noel Lopez:	06:51	Obviously your background is in marketing, what specifically attracted you to the spirit space? Robert Brown:	06:57	You know spirit, it's a fun industry. It's hard to find an industry that's comparable in terms of the types of work you get to do every day. Sometimes you take that for granted, but nothing in particular other than the fact that it's in the industry that's actually really interesting. We do a lot of interesting work, and you see a lot of interesting work coming out of spirits brands. They often are willing to try new and different things. The biggest challenge is being able to scale those things and do them in a way that drives business. That's where spirits is different from other categories, but I think just being in a fun industry where I get to go to work every day and look at cocktails and think about how people drink and have fun and have good social time with their friends. Noel Lopez:	07:49	Yeah you're making people's weekends. Robert Brown:	07:50	Yeah, not a bag gig. Noel Lopez:	07:53	I know there are specific challenges within the spirit space, specifically with making sure that you're targeting the right audience, those legal restrictions. How do you structure campaigns around that to make sure that you're targeting the right audience? Robert Brown:	08:09	The LDA we call it, legal drinking age, we don't think of actually on a daily basis. It's something that sort of been so ingrained in us and everything that we do in our process that it's not a thought. We are marketing to those who are of age, so there are some things that ... There's an organization actually, a spirits industry organization, that's in place that puts guidelines in place that tells us where we can market, how we can market, and that's across all brands. There are requirements in terms of how many people are on your site if you're running media have to be 21 plus in order to receive, in order for you to market on that site. Noel Lopez:	08:54	Oh wow. Robert Brown:	08:54	But I would say that where we are in terms of a technology perspective where we're targeting individuals versus doing less and less of managed buys, it's actually helping us to make sure that we're targeting specific people who are 21 plus, so that's becoming less of an issue. Noel Lopez:	09:13	Oh great. No, that's fantastic. Robert Brown:	09:17	It's not something that we actively think about or that hinders our work in any way. Just like any other brand who has a specific target that includes an age range, we're targeting 21 plus. Noel Lopez:	09:29	Got you. Specifically within the spirits space, you're in a unique scenario where you market your product online but you don't sell it there. Do you feel there are any obstacles there and how have you faced those? Robert Brown:	09:41	Data is one of the biggest obstacles we face in the spirits category because of the route to market, because of the legal structure of the three toe system where a supplier, owner of the brand, maker of the product can't sell directly to a consumer in most cases. There are some exceptions to that rule, but in most cases they can't sell directly to the consumer. That inability to get conversion data directly and feed that back into a conversion loop is nonexistent for the most part, but it's something that we're working to solve. We solve it with proxies like foot traffic, how many people are we driving to bars and restaurants, how many people that are seeing our media. We look at e-commerce and new partners like Drizly, our mini bar, who are third party services and not retailers, and so we can market with them in ways that we cannot directly with retailers. There is work that's happening to help to close the loop on sales and ensure that what we're doing from an awareness marketing perspective is actually leading to a conversion at the end of the day, but that is a big challenge for us in this category. Noel Lopez:	10:57	Do you find that working with gig economy type apps like Drizly that's helpful for you guys? Robert Brown:	11:03	In some ways. Yeah, it allows for the closed loop measurement in ways that otherwise we cannot easily measure. They're operating as a media vehicle for us essentially, so we're buying media from those properties. That's just a different arrangement altogether. Noel Lopez:	11:26	Then in that case I imagine your campaigns are all about awareness then? Robert Brown:	11:30	No. No and quite the opposite. Awareness is a big part of what we do from a digital perspective and getting in culture and conversation. Most spirits are lifestyle brands, where like it or not consumers choose spirits because they are relevant to them or their friend circle. So that's a big part of what we do, but there's also this whole other side of how are we driving conversions and how are we doing that digitally. As you know, consumers are on their phone throughout their day. They are on their phone when they're in the liquor store as much as they are when they are in Wal-Mart, and Wal-Mart in some states is a liquor store, but they are ... So reaching them in that environment, reaching them before they get there, getting on the shopping list that they're probably making on their phone, serving them coupons when they're in the store or before they get there, remarketing to them through CRM to get them to buy more and buy more often, that's all conversion focused digital activation. That's a big part of what we do as well. Noel Lopez:	12:40	Okay. What would you say is the biggest KPI that you're worried about tracking when it comes to that? Robert Brown:	12:47	In digital shopper and the retail environment is one side, the e-commerce side is a whole other in that there are, indirectly we are selling our products online through Wal-Mart, through Total Wine and More, through Drizly and Minibar as we've talked about, and so ensuring that we're driving sales on those platforms, we're driving visibility of our products, we're driving frequency and repurchase, et cetera, is still happening from an e-commerce perspective. But in the physical store environment, the KPIs we look at are things like store traffic, are we driving store traffic, are we driving people to download coupons, are we getting people to engage with our promotions. We get data back and that's a conversion point as well. Noel Lopez:	13:31	Okay. Correct me if I'm wrong, but it feels like Jager is a drink with a very specific market. How are you able to overcome that mindset, in a sense cast a wider net? Robert Brown:	13:41	Jager historically has been, and still is, a shot brand. It became big in the U.S. through shots, through the Jagerbomb. That still will be a focus for us, not the Jagerbomb but shots because that's how a lot of consumers still consume our product. But we're looking at widening the occasions in which we show up. When consumers are drinking a beer with their friends on Tuesday and not in those high energy moments, we also want to be there. We want to be in places where they may be drinking crafted cocktails. Jager is a product that has 56 herbs and botanicals that make it up, and so it is a craft product. Don't tell people I said that, but essentially it has those craft cues. We want to be in more occasions and we're actively working to do that. Noel Lopez:	14:38	Yeah and even taking a look at your site I've noticed there's that drink section where it has it just a straight up shot, then the fresh, then the kind of fruity cocktail. It seems like you guys are really broadening on that end. Robert Brown:	14:50	Yeah, definitely. Most brands can't live in one occasion only. Jager fortunately has been able to do that for a long time, but it only lasts so long. Noel Lopez:	15:02	How has the spirits landscape, would you say it's changed with the emergence of the landscape that we live in? Like you said, we're mobile first, social media driven, we're in the moment. How do you feel that's impacted the spirits landscape? Robert Brown:	15:13	A lot of the choices happening, in some cases still by bartender recommendation. When you go into a bar you may ask the bartender just for a shot of something and they may recommend the product, or you may say what's a good tequila and they'll recommend the good tequila, but more and more a lot of that choice, and consumers more and more armed with more information, so they're able to make that decision before they get there or even in the store make that decision or change that decision based on research online. Getting on the considerations side if they're going to be on premise, or getting on the shopping list if they're going to the off premise, is an important part of how digital can enable that consumer journey. That has definitely changed how consumers choose brands in both the on and off premise, and also how we can engage with them. Noel Lopez:	16:04	All right. Even there's been kind of a rising trend in craft brewing. Do you see that's impacted the spirits space at all? Robert Brown:	16:12	Beer as a category has been ... There are three categories that make up alc-bev, it's wine, beer and spirits. Beer as a category has actually been declining for a long time, and so that consumption has actually moved over into wine and spirits, which have been growing. And so no, it's not impacted spirits so much so as it has cannibalized other brands within the beer category. Consumers that are drinking beer, more and more are drinking craft beers, but they're also drinking spirits and they're drinking wine as well more so than the beer category. Noel Lopez:	16:51	Do you find that there have been other spirits or liquors that have been trying to mimic your formula, or has there been a struggle in trying to stay unique in that sense? Robert Brown:	16:59	I mean I think that's a constant struggle in this category. It's a very cluttered category. If you look at, and when I say category I mean spirits, if you look at the vodka isle there are hundreds of vodkas to choose from, same with whiskey, and so how do you choose. It's growing every day. There are innovations every day. It certainly requires the incumbent or legacy brands to continue to be relevant. To do that by staying in the conversation, by staying up on the technology, by ensuring that they have the latest sort of marketing engine, which digital is a central part of. Yeah, it is. It's a challenge for us. Noel Lopez:	17:38	Okay. I've got to ask, do you know where the Jagerbomb came from? Where it originated? Robert Brown:	17:44	I have no idea. I don't know. I think, certainly did not come from Jagermeister, but I think if you think about the time in which it came about, late 90s early 2000s, Red Bull had just entered the U.S.
Noel Lopez:	18:01	In 97, around that time. Robert Brown:	18:02	Late 90s, and gained popularity and gaining nationwide distribution. During that same time Jagermeister was also gaining popularity as well. So I think at some point someone just put those two together. Noel Lopez:	18:15	Magic happened there. Robert Brown:	18:16	But yeah, I have no idea. Noel Lopez:	18:19	Do you think that's created a stigma around the product and who you're currently marketing to? Robert Brown:	18:24	It certainly has created an impression of what Jagermeister can be used for, what occasion it's for. Widening that lens around which occasions I can drink it and acceptability and all of that is a big part of our job to be done. Noel Lopez:	18:44	Yeah. I've seen, you know I'm a musician, I saw that Jager has actually partnered with Live Nation and this year you guys became the official sponsors for the NHL. How do you feel those initiatives have changed the brand? Robert Brown:	18:58	We're where the consumer is. The consumer has affinity towards platforms and properties like the NHL, and we want to be there too. Jagermeister should be served ice cold, and so that messaging synergy with hockey also works very well. It's actually really good that we are the official shot of the NHL. So yeah, we're happy with that partnership. It's where our consumer is and so I'm sure it will go well for the next year. Noel Lopez:	19:28	A match made in heaven basically. Noel Lopez:	19:30	Have you seen that that's help to diversify Jagermeister as a whole? Robert Brown:	19:35	It certainly helps reinforce our brand message and align us with the premium property. I think that's some of the primary goals in reaching our consumer and getting those eyeballs. Noel Lopez:	19:48	Got you. I would say you've executed some extremely successful campaigns for Dove. How do you plan on taking that experience, what you've done there, and applying it to campaigns at Jager? Robert Brown:	20:02	Yeah we did some great things on Dove with a lot of people here that worked on it with me. The good thing about Unilever is that they, from a communications perspective, are constantly pushing the envelope. They have an iconic brand in Dove that really started the viral video craze with evolution in 2006 or 2005, or around that time, and have really been able to with a lot of their brands, in particular with Dove and what we did with Dove Men, insert themselves into culture and be relevant to that consumer. I think from that perspective, and we were doing content marketing before content marketing was a thing, and so from that perspective those are things that are still relevant today and would be relevant at Jagermeister. Things like the conversion end of things, we were one of the first in the category for Dove to do Amazon A plus detail pages and have content that is robust and effective at driving conversion, to user test experiences on e-commerce and how consumers got from media through to purchase on Amazon. Some of those learnings actually will still, I think are still relevant to companies today. Noel Lopez:	21:21	Yeah. Really tracking that whole funnel from awareness to retention and keeping that going. Noel Lopez:	21:28	To me it sounds like Jager is in great hands. Just getting a chance to speak with you is absolutely been a pleasure. Is there anything else that you think might be valuable to listeners or you might recommend as they're building out their own strategy? Robert Brown:	21:41	I think thinking about, I think one of the challenges with digital is that it's everything. Everything is either enabled or happens in digital, or can be. So part of the strategy is being choiceful and making the right choices. Choosing what works for you and how that marketing mix works for you, but also not being so narrow as to digital equals social content I think is a piece of advice I would give people. Noel Lopez:	22:13	All right great. Robert thanks again for coming on the podcast. Robert Brown:	22:17	Thank you. Noel Lopez:	22:17	It was a pleasure, and letting us learn more about your specific space, the spirit space. For everyone out there, thanks again for tuning in to E-commerce Disrupters. Please subscribe and comment. You can follow us on Twitter, Facebook and Instagram, Electric Enjin, and find more information at electricenjin.com. Now me and Robert are going to head out and take a shot of Jager to celebrate. Robert Brown:	22:40	Sounds good. Cheers. Noel Lopez:	22:41	All right thanks guys. Bye. Noel Lopez:	22:45	This has been the Ecommerce Disrupters podcast presented by Electric Enjin. Subscribe today to stay up to date on all future episodes. Please follow us @electricenjin on Instagram, Twitter and Facebook, or shoot us an email at podcast@electricenjin.com. That's enjin spelled E-N-J-I-N. Feel free to leave us any comments or questions about this episode and let us know what you'd want to hear on future episodes. Until next time, thanks for listening.